Versatility and comfort have never been so pronounced. Be amazed with the C90GTx, the best-selling model of the King Air family, ideal for those who need even higher flights. The King Air C90GTx impresses with every landing and takeoff. The model operates safely on uneven runways, including in hot places and high altitudes. With the King Air C90GTx you have room to carry whatever you need. The model has a large cabin, excellent payload capacity, and a luggage compartment in the nose of the aircraft, which means much more comfort for passengers, who don’t have to squabble over space inside the aircraft with suitcases and cargo. 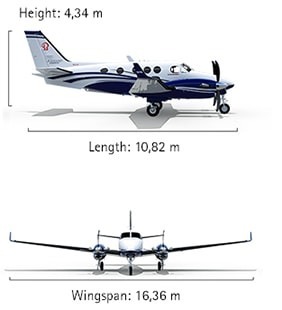 Beechcraft knows that small details make all the difference. That's why every element that makes up the interior of the King Air C90GTx has been thoroughly thought out to offer the ultimate in sophistication. You also have at your disposal a series of customizable items to make this super-machine adopt your style. Elegant and dynamic, the traditional oval cabin of the King Air family is also present in this model, ensuring not only a beautiful visual appeal but also more comfort and convenience for passengers and crew. The C90GTx has excellent interior space, one of the largest in the category.